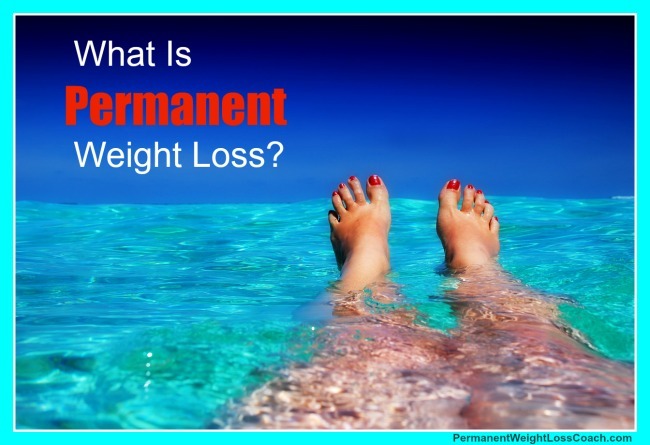 What IS Permanent Weight Loss? Permanent weight loss: What IS it? Maybe you’re not even sure if permanent weight loss is possible, but even if that’s not the case, you definitely wonder what permanent weight loss is. Does permanent weight loss mean that you rarely eat? Or is permanent weight loss only achievable by those who were born with the right genes? What if you’ve never gotten to your goal weight? Or what if you’ve gotten there but you’ve never been able to keep the weight off? If that’s your experience then how could you ever achieve permanent weight loss? These are all valid questions based on the life experience you’ve had, but also what’s interesting is that those people who are living with permanent weight loss today don’t ask these questions. Nor do they wonder what permanent weight loss is! But since you’re reading this article, you DO want to know what permanent weight loss is, so let’s take a look. In simple terms, permanent weight loss is the absence of all struggle with your weight. It’s a healthy relationship with food, respecting food as fuel rather than obsessing about food and using food for emotional reasons. Permanent weight loss is the end of yo-yo dieting and really, the definition is very simple: If you’re overweight or obese right now, then once you get a weight loss mindset you can release the fat and it will stay off. It won’t come back because in order for weight loss to be permanent you must be free of the unhealthy, overweight behaviors that put the fat on your body in the first place. Permanent weight loss is about having an easy time releasing the fat, and then the fat stays off. That’s it! Leave a comment below to share your biggest Aha from today’s article and go ahead and share this article with your friends. Everyone deserves to achieve permanent weight loss, don’t you agree? !